New Flyer Industries Inc., the leading manufacturer of heavy-duty transit buses in Canada and the U.S., announced today plans to focus on a single heavy-duty transit and BRT bus platform that features its Xcelsior brand. Xcelsior comes with a variety of propulsion options including clean diesel, natural gas, diesel-electric hybrid, electric-trolley, and now, zero-emission battery-electric. Similar to New Flyer’s previous bus models, Xcelsior is customized and configured to meet each customer’s unique specifications. New Flyer plans to further enhance its BRT styling options for the Xcelsior platform by building on NABI’s extensive BRT experience and New Flyer’s customer input. • Make product enhancements and optimize aftermarket support to better serve customer needs. 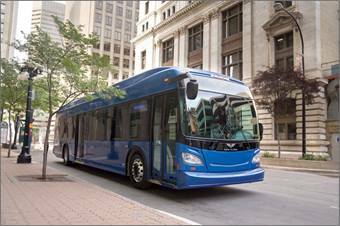 “New Flyer acquired North American Bus Industries Inc. in June 2013 to broaden our market position, to improve our technology leadership and to expand our aftermarket parts business, while providing public transit operators with long-term stability and excellence in product support. Today’s announced plan is the natural evolution and optimization of product lines at New Flyer and NABI,” Soubry explained. New Flyer expects to deliver orders as previously committed and to provide support for NABI customers of the LFW and BRT products for as long as those buses are in service. A number of NABI customers have already indicated an interest in transitioning to Xcelsior. The Company believes customers will benefit from the enhancements that result from its focus on a single heavy-duty platform. During this transition period, management expects to invest approximately $20 million in direct operating costs and capital expenditures to complete the transition, utilizing operating cash flow and current credit facilities. Management anticipates these direct operating and capital expenditures will be paid back through captured cost reductions and synergies within approximately two to three years.